The Sturmartillerie was established before outbreak of WWII as an integrative support arm of the infantry, which was far way from thorough mobility. Sturmgeschuetze - assault guns - turretless tanks armed with a 7.5 cm gun - should push forward the attack breaking any enemy resistance, destroying infantry guns, MG nests and bunkers. In the further course of the war the young service branch would have to stand the impetus of ever growing numbers of enemy tanks. This book is the first of a series. Its purpose is to introduce this small, but remarkable service arm to the reader. 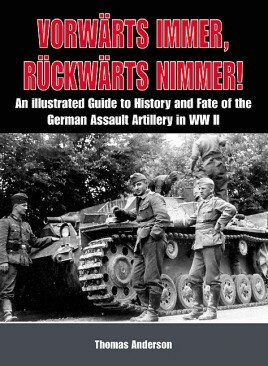 Development and combat of of the first units in battery - scale and the later Sturmgeschütz battalions resp. brigades will be explained by photos, diagrams and colored artwork. The author turned his attention to the identification of Sturmartillerie units - markings and characteristics will be clarified wherever possible. During his research the author relied only on sources found in German archives. Subjective recollections of veterans have been used to illustrate the nature of this service arm. For any modeler of German armor they will find a real treat in the number of images for research of their builds. The history and information provided with this first book in the series will not disappoint those that are researching this subject.